Ufone is one of the bigges telecom company in Pakistan that have a lot of customers using different ufone daily internet packages 2018 on their numbers. Ufone invented various ufone daily internet bundles for their customers time by time and have many ufone 24 hours internet packages offers so that every user can choose its needed or favourite one package. Recently ufone have purchased the 3G license so that its customers can use faster internet service so this is one the many reasons that a ufone have increased its customers number. Ufone daily internet packages will be the part of 2018 also. Ufone daily internet packages prepaid are four types. Ufone daily light internet pkg, ufone daily heavy internet package, ufone special daily internet offer, ufone mega internet bucket. 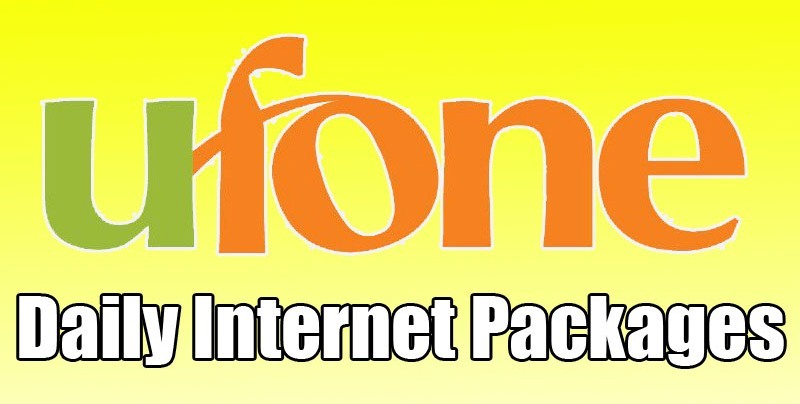 These ufone 1 day internet packages are best for everyone. Details of the all ufone internet daily packages are given below that you can check. Dial *2256# from your ufone numbe to avail this offer. Rs. 10 will be charged for this package. This offer will be valid for only 24 hours. Just Dial *2258# from your ufone number to get this offer. This offer is valid for only Rs. 14 PKR. Just Dial *3461# from your ufone number to get this offer. This offer is available only In just Rs. 5 PKR. 50MB free internet data volume. Just Dial *550# from your ufone number to have this offer. This Offer Is Available in just Rs. 99 PKR. You will get 1024 MB free internet data volume. This offer will be valid from 01AM to 6AM Only. After the consumption of bucket volume, charging will be done according to the default tariff i.e. Rs.20 for the first MB and user will get next 19 MBs free, then will get charged for the 21st MB and will get next 19 MBs free again and so on. If U are using Mega Internet Bucket and Super/Mini Super Card simultaneously then usage against freebies will be charged from Super/Mini Super Card volume. Default internet rate on Super Sasta package (only for Super sasta package with Rs. 50 free air time) is just Rs. 2+Tax per MB at a charging pulse of 512 Kbs. On usage of 25 MBs you will get 150 MBs free till midnight. To check remaining resources dial *707#. An FUP of 100 MBs per day will be applied on Social Daily bucket. An FUP of 500 MBs per day will be applied on Dialy Light, Daily Heavy, Special Daily & Dail Chat buckets. Multiple subscriptions of the same bucket are not allowed for Monthly 3GB and Monthly 10GB buckets. Default internet rate on Super Sasta package (only for Super sasta package with Rs. 50 free air time) is just Rs.2+Tax/MB at a charging pulse of 512 Kbs. On usage of 25 MBs you will get 150 MBs free till midnight. To check remaining resources dial *707#.